In May, June, July and August 2011, Influenza activity was low in North America, Europe, Northern Asia, Middle East and North Africa. Tepid latitudes of Northern hemisphere remained at baseline inter-seasonal levels. The 2011 influenza season in South Africa peaked in the end of June. The majority of samples were identified as 2009 H1N1 virus. Flu levels were still moderate in early July but illness activity became low by the end of July. Dominican Republic, Cuba, Honduras and Brazil observed moderate activity (peak was in the end of June/beginning of July). Columbia had active circulation of 2009 H1N1 virus, but there were no new cases in July and August. 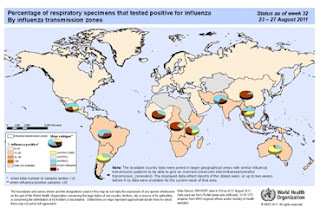 Illness levels in Peru and Bolivia also returned to low levels. Flu activity in August was low in countries of Western Africa (Ghana, Cameroon and Senegal), and Southern Asia (India, Bangladesh, Thailand, and Singapore). Google flu trends predicted increased activity for South Africa and Chile in June-July and Uruguay in July-August. WHO data showed that flu levels returned to low in South Africa, but started to increase for Chile, Uruguay and Argentina marking the peak of the season. In Australia, influenza-like illness consultations and laboratory-confirmed cases continue to increase. The flu season started in the end of April, rates slightly declined in mid May but kept increasing since. The most common virus was influenza A(H1N1)2009 but influenza B was also prevalent, unevenly distributed across the country. According to the ESR Kenepuru Science Centre and the WHO, flu incidents in New Zealand increased from mid-May through the end of July, but decreased during the first two weeks of August. ILI activity in New Zealand remained around expected levels and the majority of viruses detected have been influenza B. See the latest CDC Global and WHO updates for more. It is very important to raise the awareness of the public regarding important issues like these. The A(H1N1) incident caused so much unnecessary panic because we were caught off guard. Awareness is the key to a successful eradication of transmitted diseases like influenza. I agree. If people are aware of the causes, symptoms and other things related to influenza, then the possibilities of getting such kind of disease will be lessened. This also true to other respiratory diseases. In case of mild symptoms and signs like headache, fever and severe sore throat, it is imperative to take medicines and consult the doctor as soon as possible. good tools and also grenades as well as Toxin Gas. Play http://minimilitiaa.in in numerous tools and OS they are. So to Download and nice. all types and kinds of songs; from a tiny advertisement jingle to a tubidy download Songs Engine. This site caters mostly to those individuals. which really is a immature share of the problems many people unrecorded with sect now, but but making improved lives for group that is direction on feat them much , getting them punter aid and making certain their kids get enlightened.